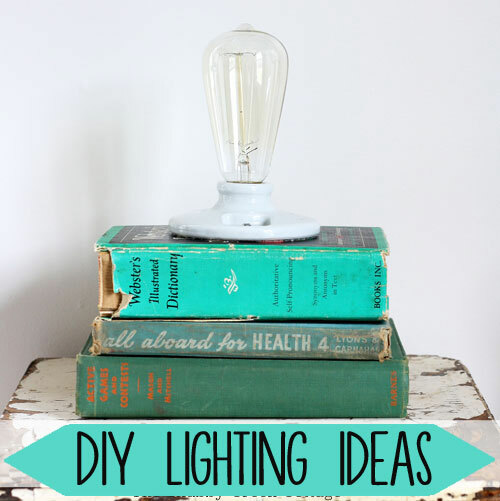 I’m always a fan of easy DIY lighting ideas – they’re usually budget friendly & there’s no better way to get a truly unique look. Today I’m sharing my favorite ideas so you can get the look for less. From lamps to shades to pendants, there’s something for every room in the house in this collection. Step by step projects to light up your life! How pretty! Where can I find a light bulb like that? I’ve never seen one in stores before. I found mine at Lowe’s, but Anthropologie sells them, too. I don’t see my dilemma addressed in any of these pictures. We have a wrought iron replica of the Eiffel Tower and we’d like to make it into a lamp for our screen porch. I can’t figure out how to get the lamp kit to attach to the wrought iron. I thought about using a big cork, but when the wind blows, the whole thing would fall apart. Anyone have any ideas? The replica is about 3 feet tall. Could you use a bit of the threaded rod to stick on top of the tower and run the cord through it? If not, try some metal pipe to make it slip on top, then use a strong adhesive (like E6000) to keep it all together? My solution came in a totally unreal way. We do everything ourselves and would never think of hiring a professional–BUT we were rummaging around in a junk store and heard a conversation about the “lamp guy.” One lady said Sylvester could make a lamp out of anything. After a brief conversation with them, they told us where to find this genius. $18 later, we have our lamp, and it’s beautiful on the screened porch hearth! What a great idea, you could change the look up with all the new edison base light bulbs. Thanks for sharing this great idea.